Throw a Ball: Each student gets a turn to throw a ball to knock over the other team's cup points... Each cup knocked off of the pyramid is lost. Free Shot: Each student gets to shoot a ball from outside the "yellow and Black line". 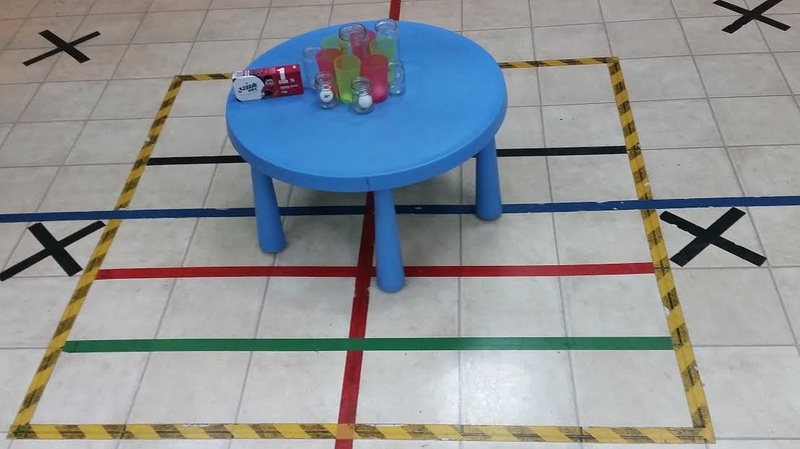 (Square line outside of the table with the cups and jars) If the student gets a ball in one of the cups or jars, they win a cup point. *With jars, and 2 different colored cups, the teacher can make it more complicated for older classes. *Each team has a color, if a team throws in the wrong cup, the other team is awarded a cup point. Pong Mania: One student from each team plays at a time. The teacher throws many ping pong balls on the floor. The students must race to throw balls into the cups/jars. 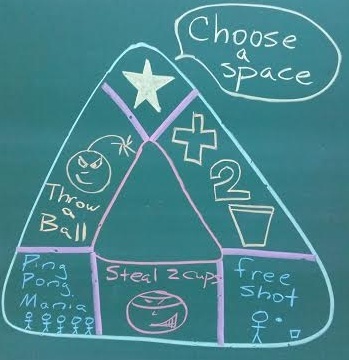 (From behind the yellow square) The first student to throw a ball into a cup/jar is the winner and is awarded a cup point. *For older, taller classes, I made students throw from a line further outside the yellow and black line. As my floor is made of square panels, this was easy. If you don't have that in your classroom, 2 different square lines should be made at different distances for different aged students. These games were fast and easy to play. Each student would get a chance to play each time atleast once.